Last night I made risotto with mushrooms and asparagus, the old school way. It was delicious; it would have been perfect if I used true Parmigiano-Reggiano. Risotto is meant to be eaten immediately while still creamy and hot. Due to the starch, once risotto cools, it turns into a lump. I had about two portions leftover. Today, I pulled out the leftover risotto which was almost brick like. Perfect for making this risotto into pan-fried goodness. I portioned the leftovers into four portions and hand-shaped them into cakes. Then I set up a gluten free breading station: 1. gluten free flour; 2. beaten egg with seasonings; and 3. gluten free panko. It turned out to be a messy endeavor. Therefore, I knew the end result was going to be delicious. Heated a non-stick 12" fry pan over medium heat with a generous pour of olive oil. Allowed to heat up for a couple of minutes before adding the risotto cakes to the pan. Gently space the cakes in the pan. Allow to turn golden brown, about 5 minutes, and carefully turn over. Cook for an addition 5 minutes. Remove from pan and place on paper towels to blot excess oil. To plate this fancy and appealing, cut with a sharp chef knife and prop up like I did in the above picture...or use your own creativity. These cakes tastes just as you would imagine: risotto, pan-fried as a cake in a very light coating. Crispy and delicate on the outside. Warm, rich, and slightly gooey on the inside. An old friend was coming over for lunch and I wanted to make a classic for a delicious, simple lunch. My main goal was to perfect my recipe for a gluten free savory pie crust. I wanted a good crumb to it, somewhere between a flaky and mealy crust. This undertaking is far from trivial, but I felt confident with a trial run at culinary school (see my blog a couple of postings ago). Trying to stay away from bovine milk, I wanted to use goat milk products (that has a different shape casein protein, hence lower chance of allergic reaction and it is lactose free) with that delicious, characteristic flavor. With great success, the crust had a great consistency without being "sandy". As my friend said (she has not had any GF baked goods before, so no expectations) that it was an interesting crust. She has never had a crust with this texture. She liked how it was both flaky and mealy. The texture of the custard was a light and delicate custard with no cheesy stringiness and without an overt goaty flavor. This is a very easy dish to make, classically elegant for entertaining, yet so simple and satisfying. The perfect accompaniment is a simple mixed green salad with vinaigrette dressing. Here is the recipe for your own personal use (see disclaimer on right) to try out. Please let me know how it works out for you. Combine the tapioca + millet flours with the salt until uniform. Add in shortening and egg whites using a mixer. Put into a metal pie pan with about 1/4" thickness and scallop-shape the edges by pressing finger & thumb on one hand into finger of other hand. Prick the bottom with a fork to aerate the crust while baking. Sprinkle the chives + chervil evenly into the bottom of the pie. Sprinkle the cheese evenly into the bottom of the pie. Beat together the eggs, milk, and salt + white pepper + nutmeg. Carefully place pie on baking pan and place in center of oven. Bake at 375F until the filling is set, turning as needed for even cooking, until it is lightly golden brown on top. Cooking time is around 40-45 minutes. Remove from oven and allow to rest for at least 10 minutes before cutting (or it will not hold shape). Serve hot or cold. Cut into wedges of desired size. What I Learned from Shirley Corriher: Chef & Biochemist Extraordinaire! Shirley Corriher was our guest speaker for the Cincinnati Section March Meeting of the American Chemical Society. I want to follow in her footsteps, applying my experience, knowledge, and technique with organic chemistry to recipe development for gluten free foods and molecular gastronomy applications. I was fortunate enough to sit next to her during dinner and we discussed topics such as molecular gastronomy and the evils of gluten before her presentation. When I told her that I want to be the Shirley Corriher of the gluten free world, she commended me with enthusiasm. She finds the recent gluten epidemic horrific – her daughter lost three babies due to problems with gluten. How devastating. We concurred that there is a lot of work to be done on the gluten free horizon, and I am the one the start this revolution. Every second of this experience was worth its weight in palladium (Chemist joke). She is a biochemist and a food writer and consultant. She is the author of CookWise (James Beard Foundation award winner) and BakeWise. In these books, she shows how scientific insight contributes to best results with cooking and baking. She is a close colleague of Harold McGee and works as the “Mad Scientist” consultant to Alton Brown’s Good Eats. She also consults with numerous chefs, including the late Julia Child. I learned the origin of Molecular Gastronomy goes back to about 1988 at the biannual "Science and Gastronomy” meetings in Erice, Italy. These meetings were started by Professor (of physics) Nicholas Kurti and Chef Elizabeth Cawdry Thomas (who had an affinity for marrying physicists). They wanted to describe food prepared in a highly scientific manner to make it sound more impressive; it was an their joke to make the food prepared very scientific and it was to some extent. I truly admire the progress of molecular gastronomy when created from the correct prospective. An example of this process is eloquently described by Chef Grant Achatz's lecture at the New York Public Library Seminar series this past October, 2008 (available on iTunes). He uses molecular gastronomy techniques as a means to an end desired result of an taste experience, creating an olfactory emotional flash back; not for the sake of using the technique to make him or his food look clever and smart (although he is both). All green vegetables have chlorophyll pigments that have a Magnesium (Mg) atom in the center of the porphyrin ring that is responsible for the vivid green color. It can be easily displaced by acid (anything with a pH less than 6, i.e., vinegar, citrus juice, tomatoes, the juice that is created by cooking vegetables), therefore losing the green color and becoming bitter. Since acid is generated when vegetables are cooking, draining that water gets rid of that acid – hence, blanching. It is a little bit more work, but it worth it for the best tasting, non-bitter vegetables. One example she noted was working with Julia Child who would call Shirley frustrated that her creamed spinach would end up bitter even after adding some heavy cream. Shirley proceeded to tell her that she must blanch and drain the water before adding cream. Julia Child did end up using this method for the best results for tender and sweet creamed spinach. The orange pigment that is found in carrots, tomatoes, and orange squash is beta-carotene and is heat and acid stable. Therefore, no extra precaution is needed in cooking vegetables high in beta-carotene. The deep red to violet pigments in vegetables and fruits such as blueberries, red cabbage and beets contain anthrocyanins and turn blue when subjected to basic conditions such as lye or baking soda. These pigments need acid conditions to maintain their color. That’s why classic combinations exist such as cabbage with apples (which are acidic). Be careful with walnuts – neutralize them by roasting before adding to vegetables/fruits that are rich in anthrocyanins. Anthrocyanins are powerful antioxidants and it’s important to keep them like this by keeping them acidic for dietetic benefits. Baking is very tricky with an understanding what acts as a structurant versus a destructurant. Structrants include thing that build structure and body to a baked good such as gluten protein and egg proteins (whites are drying in nature). Eggs need an acidic environment in order for them to set/coagulate; milk/creamer has buffers in it therefore preventing eggs from setting. Destructants are ingredients that give the ooziness to baked goods such as fats and butters. Over-leavening is easy detected by the sign of a big dip/sink in the middle of a baked item. This can be prevented by allowing the batter to rest for at half an hour before baking. If sugar and/or Calcium are retained in the plant cells, it will not break down, i.e., it will not soften upon cooking. A good example of this is the old wives tale of cooking corn cobs with sugar. Adding sugar will prevent the corn from turning too soft, keeping it firm after boiling. Avoid putting sugar in cooking starches if a tender product is desired. Another watch out could be extremely hard water which is high in Calcium. If you are finding it difficult to soften dried beans, try using distilled water for best results. Another wrench in starch network is acid. Anything acidic will prevent starches from swelling, hence thickening will not occur. Examples are rice, potatoes, and legumes with vinegar, tomatoes, citrus, etc. On specific cooking topics, I asked her about a problem I was having in recipe development for a coconut milk based, milk-free, panna cotta and puddings using gelatin. My prototypes were a disaster – gray and syrupy messes. She pointed out the fact that coconuts, like other tropical fruit, have enzymes that chop up proteins such as the ones in gelatin. Papaya and pineapple are often used in marinades to break down the connective tissue in meats to tenderize them. Well, looks like tropical fruit + gelatin ideas are not going to work. I will have to try making my tropical ideas into confectionery. 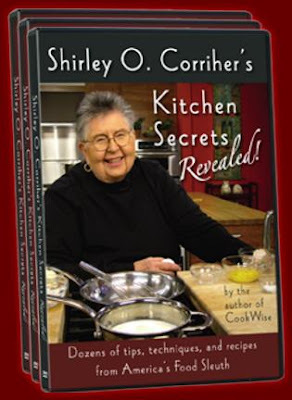 I highly recommend reading Shirley Corriher’s books: CookWise and BakeWise. With her insight, we have guaranteed results in the kitchen, and gain scientific insight and understanding of why things do and don’t work. Remember, cooking is a series of physical and chemical transformations with an artful hand. In the kitchen we can all be creative chemists when we harness this knowledge. From one of my favorite movies as a teenager, "Heathers" 1988 with Winona Ryder & Christian Slater . . . .
Heather Chandler: Is this turnout weak or what? I had at least 70 more people at my funeral. Veronica Sawyer: What are you doing here? Heather Chandler: I made your favorite. Spaghetti. With lots of oregano. Dinner! Ah, yes, spaghetti with lots of oregano is one of my favorites, too. I figured it was time to make my latest interpretation this famed dish. Simple and rustic, yet done with a careful hand. I made this for lunch, would be just as satisfying for dinner, with some of my favorite ingredients. Altogether, this dish took me about 15 minutes to make. It is just a matter of multitasking. First start the boiling water for the Le Veneziane Corn Fettucce. Then in a small saute pan, heat some olive oil with minced garlic and finely sliced shiitake mushrooms. Allow that to cook down a couple of minutes on medium heat, adding in some salt, white & black pepper. Threw in a handful of peas and cooked for a couple of more minutes. Cook the pasta to a tender al dente, strain, and toss with the sauteed garlic, mushrooms, and peas. Add in lots of good quality Greek oregano. My favorite oregano hails from Limnos, which is the most pungent. In another saute pan, fry an egg over medium and top the pasta with it. Sprinkle on a little Cretan oregano, lighter and slightly lemon, on top of the egg. No cheese. It is not needed in this dish; not even a sprinkling of Parmesan. Once the egg's yolk is cut, it adds this wonderful creamy richness to the dish that is divine. This dish looks so simple and that is the beauty in it with the flavors and textures clean and simple, complimenting each other with ease, but have enough contrast for the flavors and textures to pop. Oregano is one of my favorite herbs. I love the super intense aromatic character. I bring back half a kilogram every time I go to Greece. That is over one pound, which is enough to hold me over until next trip there. Usually, dried herbs lose their flavor with the 90% moisture content the their delicate volatile flavor compounds. Oregano is the exception to this rule, since it is native to hot, arid areas and the aromatic flavor compound stay in drying conditions (McGee). The plant originates from the Mediterranean region, where its pungency is in direct proportion with its quota of the sun. The Greeks and Romans were responsible for the spread of this plant across Europe, where it became known as Marjoram. The New Englanders took it to North America, where there arose a further confusion of nomenclature. Until the 1940’s, common marjoram was called wild marjoram in America, but is now know as oregano. In certain parts of Mexico and the southern states of the USA, oregano is, confusing, the colloquial name for a totally unrelated plant, a type of verbena, that has a similar flavor (McVicar). The penetrating quality of oregano comes from the phenolic compound carvacrol. The Greek oreganos are typically rich in carvacrol, while milder Italian, Turkish, and Spanish oreganos contain more thyme-like thymol and fresh, floral, and woody terpenes (McGee). 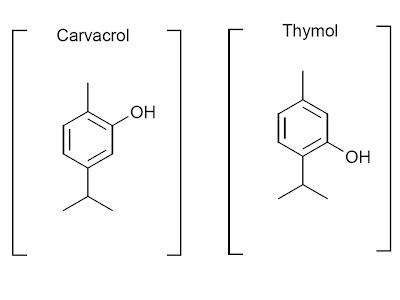 Carvacrol, or cymophenol, is a monoterpenoid phenol. It has a characteristic pungent, warm odor of oregano and a pizza-like taste. Its low toxicity together with its pleasant taste and smell suggests its use as a food additive to prevent bacterial contamination (Wikipedia). One very important physical property of carvacrol to point out is the very high boiling point of 237oC/459oF, meaning that the wonderful flavor of oregano can withstand a great deal of heat before volatilizing. This makes it perfect for an oven-fired pizzas and roasts up to 450oF for a long time and not lose its flavor. Pomelos require serious breaking down. The pith is thick, about 1/2 of an inch. And the membrane between the sections of the pulp is tough. Therefore, the only parts of the fruit that are edible is the pulp and the peel. My goal was to make the most of this delicacy and make the following shrimp salad and candy the peel. The pulp was a beautiful pink (much to my surprise) and it has a nice citrus flavor that is similar to ruby red grapefruit, but not as tart and sharp. The pulp is large and firm, making it easy to separate - perfect for a salad. Pomelo Shrimp Salad - I wanted to capture those incredible Thai flavors, combining some fish sauce with palm sugar and lime juice. I added in some chili sauce for slight spiciness, kaffir lime leaves for that delicious clean & herbal lime flavor, and finely minced shallots for that mild and sweet pungency. Carrots were also added for texture and color contrast in addition to some sauteed shrimp. Delicious! The salad was sweet yet savory, tangy and spicy with great texture. Maybe next time, some chopped cilantro to add some green color and additional herbal flavor. 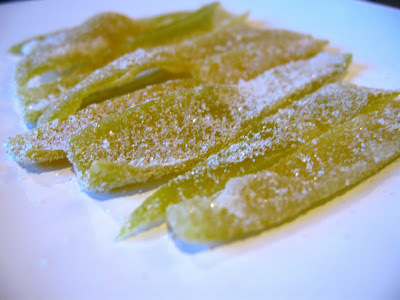 Candied Pomelo Peels - There is a lot of peel on a pomelo. Why let it go to waste? It can be preserved for a long time after preserving in a sugar syrup; and can be used creatively for garnish as needed. It took about 1 hour to cut and clean up the rind/peel. There is so much surface around, and the pith is very thick and Styrofoam-like. The trick is to remove as much as the pith as possible, the pith is very bitter. Once that is complete, the peels are blanched three times to remove bitterness from the peel. Then it is cooked in a sugar syrup until for 45-60 minutes. At this point, the peels have transformed into this beautiful chartreuse stained glass. Finally, after cooling on a rack, I tossed them in granulated sugar. Now, I can have a sliver of pomelo whenever I want, at least until they are gone.